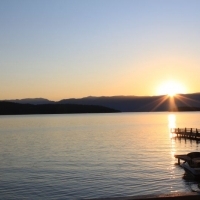 A quaint village on the western shore of Flathead Lake, Rollins is noted for phenomenal beaches, mountain views and easy access to attractions and activities throughout the Flathead Valley. Be sure to stop at the local restaurant for the "best burgers on the lake" (buffalo burgers, no less) and homemade huckleberry milkshakes made with Western Montana huckleberries. Lounge on the beach on the shores of Flathead Lake in Rollins.